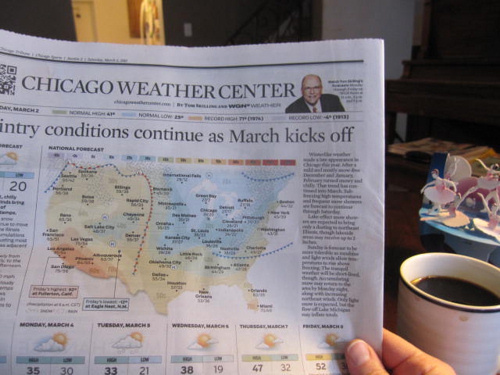 My weekend started with a hot cup of coffee and the newspaper, which was the perfect beginning. Perfect, because for the rest of the weekend we were on the go! Saturday was the Fun Fair at Lily and Emmy’s elementary school, and it lived up to its name. We had FUN! 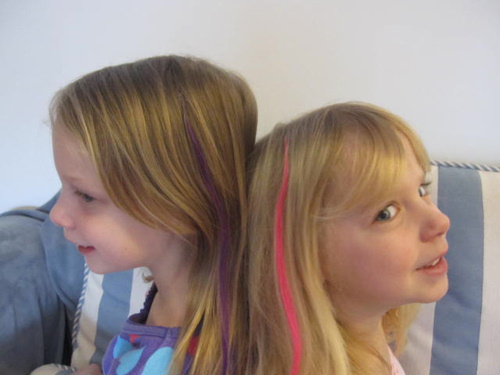 Lily and Emmy were out-of-this-world happy when I let them get a colored streak in their hair. There were games for the kids to play and a silent auction for the adults. Ed and I were out-of-this-world happy when we won the bid for a dinner out and Chicago Philharmonic tickets! Now all we need to do is find a babysitter. Tips and Tricks Tuesday: I’ll share a new tip with you and have a link-up for you to share your own tips and tricks. Vlogging Wednesday: I’ve been practicing a YouTube trend…see if I’m successful! Sounds like a great weekend — I love the streaks in their hair! Ugh, we went to IKEA. Sure, we finally got a love seat, but that place is like a zoo! We've gotten some cabinets from IKEA that we love…but I hate shopping there! It's soooo crowded! This weekend did seem to go by so fast! Sounds like you had a fun weekend. Can wait to see your vlog! I have a guess as to what is is but will keep it to myself for now. 🙂 My weekend… a night out with friends, 2 family dinners and babysitting. A night out sounds like fun! I need that right now! My recent post This Should Get Us On Oprah! Thanks! I'm really excited to have a night out!